Coming from different musical backgrounds, the now five active members of Golan have cultivated a recognizable sound of their own. By mixing a vast array of instruments, both live and in the recording studio, they definitely stand out. Formed in 2014, the group has had one of the fastest ascents on the Romanian electronic music scene. Quick to establish band status, they have been largely credited for bringing a whole new feel/vibe to their niche, much more so through their intense, remarkable live shows. The authenticity and ever evolving complexity of their music and live shows made way for a fast-growing fanbase at home, while also becoming a new addition to many European indie festivals and events. From one side of the stage to the other you have Alex (keyboards, flute, trumpet and the hang pan drum), Florian (bass, guitar and synths), Iulian (drums), followed by Ernesto (percussions) and Mihai (vocals, live sampling, DJ). The variety of live instruments, vocals, sampling and DJ-ing balance each other perfectly and bring that organic feel to their performance. 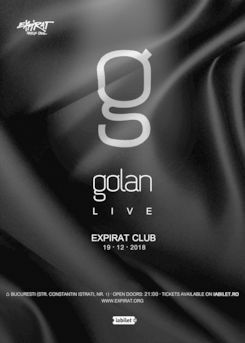 For Golan, pushing the limits of live electro pop music means bringing an array of instruments on the same stage and masterfully joining their sounds into dreamy musical effects by way of keyboards, guitar and bass, percussion, flute, trumpet, a hangpan and vocals. They have extensively showcased their musical skills in over 100 gigs annualy, ranging from festivals to club events and parties, from concert venues to private events. Touring with Parov Stelar throughout Europe’s biggest cities and on their own at international festivals like Sziget, Open’er Festival, united Islands of Prague, Fete de l’Europe, Europa Vox, Frequency Festival, Burg Clam Festival, Festival au Board de L’eau, Malwiese Festival, Eurosonic, Budapest Showcase Hub Festival along a few others. Opening act for Roisin Murphy in Vienna and Bucharest and for Kings of Leon, also in Bucharest. Their established band status gained them top spots at the main music festivals in Romania: Electric Castle, Untold, Awake Festival, Timeshift, Afterhills, Neversea and others. In 2015, Golan released their first EP with Motor Entertainment, followed by the second, this time with Etage Noir, in 2016. The following year, the group signed their first album deal with Universal Music in Romania and internationally, in 2018. With an evergrowing fan base, Golan jumped in just 6 months from being known as the only Romanian niche band that sold out its album launch event (2k people), to the only Romanian band that has sold out Arenele Romane open air venue (5k people), becoming the first Romanin to have international acts opening their shows for release of their album: J. Bernard and Fhin. „INTRO” is a testimony of what Golan’s musical journey has meant, from the very first beginning to the present day. The 14 tracks come from a very close and personal approach that each member shared through their own creative standpoint, resulting in what some might say „supremely refreshing”. The album includes 11 videos depicting live performances and official releases directed by some of the best reviewed creatives in the industry. The band’s main focus for the near future will be creating new tracks for their sophomore album. Promotion campaigns and touring across Europe come next. Not just a studio band, but a full live band capable of creating impact and moving audiences with their music in every corner of the world. The perfect way in which the instruments are mixed and join forces creates a vibe that transcends time and space. Their live act feels as if from another galaxy and is consolidated visually by the band’s own signature light show and graphics. 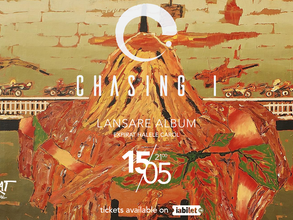 The tickets are available in electronic format on www.iabilet.ro, also in the following stores that represent the iabilet.ro phisical network: Flanco Stores, Diverta, Hard Rock Cafe, Cafe Deko, Vintage Club, Quantic Club, Expirat Halele Carol (18:00-22:00), Beraria H, Unirii 1 Subway Station next to the Metrorex ticket office, Muzica Store, IQ BOX - Telekom Stores, Perfect Tour Agencies, Uman Stores, Libmag Bookstore (I.C. Bratianu Boulevard, No. 6, District 3), Ballet House. Beside, you can use Selfpay terminals all over the country. Online on www.iabilet.ro, you can pay with a credit card, through Paypal. Also you cand pay through the Vodafone or Orange invoice - in this case the payment will be registered until the end of the month - or with cash on delivery through Fan Courier all over the country.